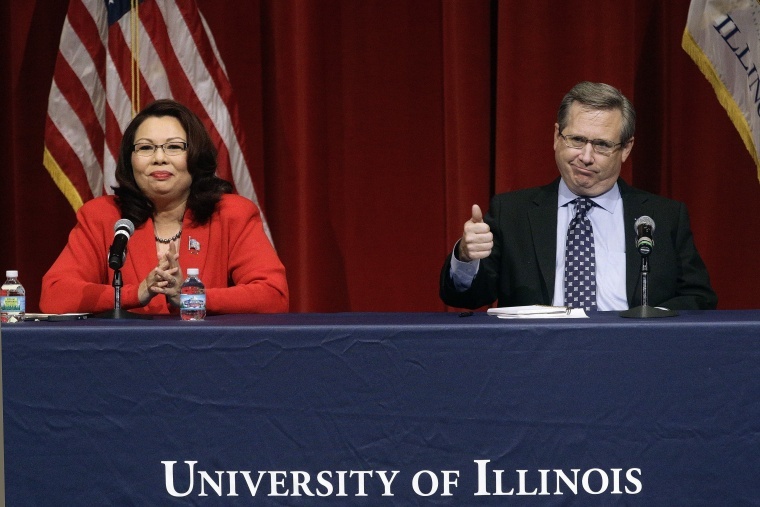 Illinois Sen. Mark Kirk is again under fire for making racially-charged comments, this time for questioning the military service of his Democratic opponent’s family. Kirk responded: "I had forgotten that your parents came all the way from Thailand to serve George Washington." Though Duckworth, who was born in Thailand to a Thai mother of Chinese descent and an American father, did not respond on the stage, she tweeted a photo after the debate of herself with her parents — her father displaying medals of service on his coat. "My mom is an immigrant and my dad and his family have served this nation in uniform since the Revolution," Duckworth wrote. Duckworth's late father, Franklin, served in World War II and has "traced his lineage back to an ancestor who fought in the American Revolution," according to a 2012 Mother Jones profile on Duckworth's run for Congress. "Sen. Kirk's statement speaks for itself, as does Tammy's response," Matt McGrath, Duckworth's deputy campaign manager, said in an email to NBC News. To be clear, GOP Sen. @MarkKirk just questioned the Revolutionary War service of Tammy Duckworth's family because she is of mixed heritage. My jaw dropped watching the video of @MarkKirk insulting remark about @RepDuckworth's family. Kudos to her for being all class in response. The comment also drew a fierce rebuke from the Democratic Senatorial Campaign Committee, with spokeswoman Lara Sisselman calling it “offensive, wrong, and racist.” She also pointed to the fact Kirk exaggerated his military service on his campaign website, describing himself as a “veteran of the Iraq War,” while he only served in the Navy Reserves and was never deployed. “Senator Kirk has been caught lying about his military record over ten times, but he was quick to launch false attacks questioning Congresswoman Duckworth’s family’s long history of serving our country. A struggling political campaign is no excuse for baseless and despicable attacks, and Senator Kirk owes Congresswoman Duckworth and her family an apology,” Sisselman said. The Kirk campaign first shot back in a statement that offered no apology or clarification of the remarks and instead refocused the debate on Duckworth. "Senator Kirk has consistently called Rep. Duckworth a war hero and honors her family's service to this country. But that's not what this debate was about. Rep. Duckworth lied about her legal troubles, was unable to defend her failures at the VA and then falsely attacked Senator Kirk over his record on supporting gay rights,” said Eleni Demertzis, spokesperson for the Kirk campaign. On Friday, Kirk tried to tamp down the backlash and tweeted "sincere apologies to an American hero." But even absent any gaffes, Kirk has long been seen as the GOP’s most vulnerable senator. Public polls have given Duckworth a comfortable lead over the Republican, who faces a steep uphill battle to begin with running for reelection in a deep blue state during a presidential year.